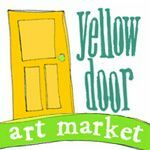 This entry was posted in Events & news and tagged art galleries, Berkley Michigan, creative community in Michigan, Michigan artists, Michigan authors, Yellow Door Art Market by Cindy La Ferle. Bookmark the permalink. I was just there a few weeks ago. I loved it! Awesome venue!